I was able to create this process completely using a combination of Podio, Zapier, Globiflow and Lob. Here is a video demonstration of the entire process in action. It’s amazing how much time this could save you. Here is an explanation of what each one of those services is and how I used them. Podio is my lead management system. All my leads get pulled into here in a variety of ways. Once a lead enters Podio, it is then pushed through my Lead Funnel until it is either a deal or dead. Each stage of the funnel is represented by an App. The app is where I can keep track of the data that best relates to the stage of the lead. In my Offers App I keep track of such things as offer amount, date, status, recipient and how the offer is made. I like to call Zapier The Connector. The reason being is that it is a service that allows you to connect different products on the internet. In my last post I showed you how I use Zapier to connect my Investor Carrot website to Podio. To be a bit more specific, Zapier doesn’t really connect the apps as so much allows you to pass data from one to another automatically. It’s such a great tool! GlobiFlow is what takes Podio to the next level in terms of an automation tool. It allows you to setup process flows (work flows) in Podio to replace many of the manual tasks you would normally have to do. A workflow gets triggered when a certain action takes place. Add a new lead, a task gets automatically created to call them tomorrow. You change a lead’s status to Make Offer, an offer letter gets created and mailed (or emailed) to them. Get the idea? Lob is a nifty little service. They say Send Physical Mail as Easy as Email. To be honest, they are correct. You basically send them a file and a mailing address and they do the rest. What differentiates them from a service like Click2Mail is that it can be integrated into ANY service….Yup…even Podio! This is exactly what I used to automate the sending out of my Offer Letters. This has been my main app from the beginning so I’m not going to go through how I set it up. 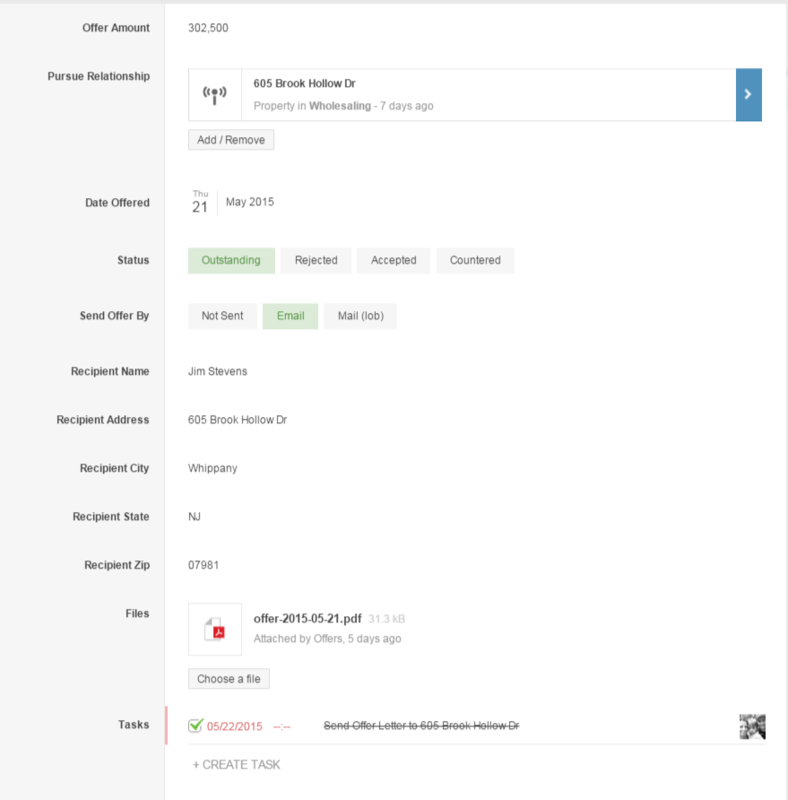 You can refer to my post Podio – Creating Apps and Automating with GlobiFlow and Zapier to get the details. However I did make some minor changes in order to make it fit into my new process. To facilitate pushing a lead into the Pursue App I needed to create a trigger. After looking at some other implementations of Podio, the best way to do this is by using a category field. The most logical category field was the status field. So I adjust it a bit to include a status of Pursue. The rest of the Property App pretty much stayed the same. If after the initial conversation with a seller I determine that I want to pursue a lead further, I’ll pass it along to this App. Now I’m not really passing along the property lead. What is happening is that the Property Lead is still staying in the Property App, but a new record is being created in the Pursue App. This is where I can record additional property information that will help me determine if I should make an offer or not. 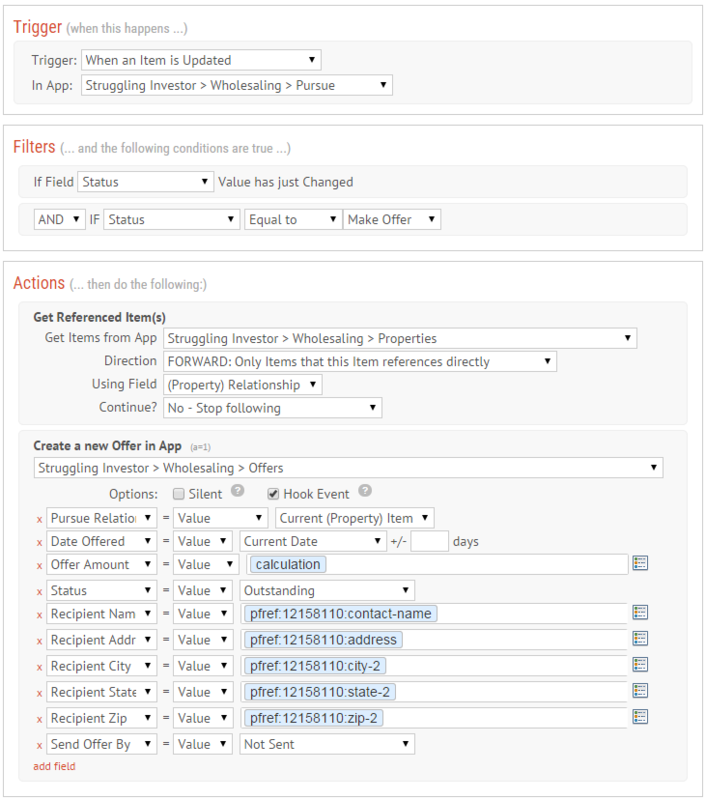 The Pursue record is linked back to the Property record by a relationship field. This allows me to refer back to the property lead information if I need to. Hopefully this makes sense. If not, maybe after explaining the Pursue App setup, things will become more clear. The Pursue App is Stop #2 for a property lead. It’s purpose is to allow me to manage and keep track of leads that I think might be a deal. As a wholesaler, my next step is to do property research to determine things like ARV and Repair Estimates. This app will hold that information. Just like with the Pursue App, a record will be created here when I decide to make an offer on a property that I’m pursuing. There will be a link back to the Pursue App record and Property App records so I can refer back to them. When a record gets created here, Globiflow detects this and automatically creates the Offer Letter. That offer letter then gets attached to the offer record. I’ll explain how this is done in more detail below. Not Sent. The default status. Gives me the opportunity to review the offer letter and make any changes before sending it out. Email. Changing the Send Offer By value to this will send the Offer Letter to the seller by email. Mail (Lob). Changing the Send Offer By value to this will trigger send a message to Zapier. 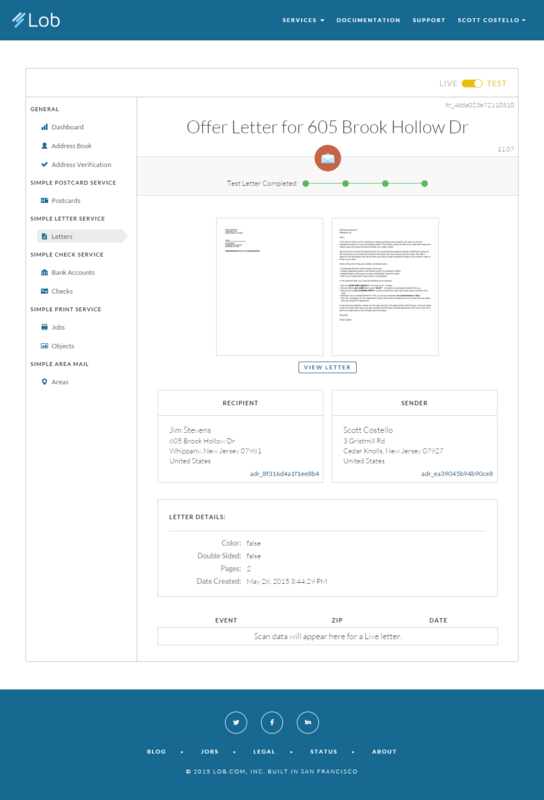 Zapier will then pull the information and Offer Letter from Podio and load it into Lob.com. Lob will then do the mailing for me. I will walk you through the entire setup process for these Podio Apps. I created 8 custom made videos to show you every step that was taken. It really is very simple and if you can duplicate this process you can pretty much do anything in Podio. There are 4 different tools at work here which is a few more pieces then I normally would like. Since Zapier, Globiflow and Lob only consist of simple, one off routines it doesn’t bother me that much…as long as it works consistently. I haven’t been working with Podio long enough to be fully confident just yet. I’m getting close though. Here is a quick overview of how all the pieces will work together. Start at the left and move right. 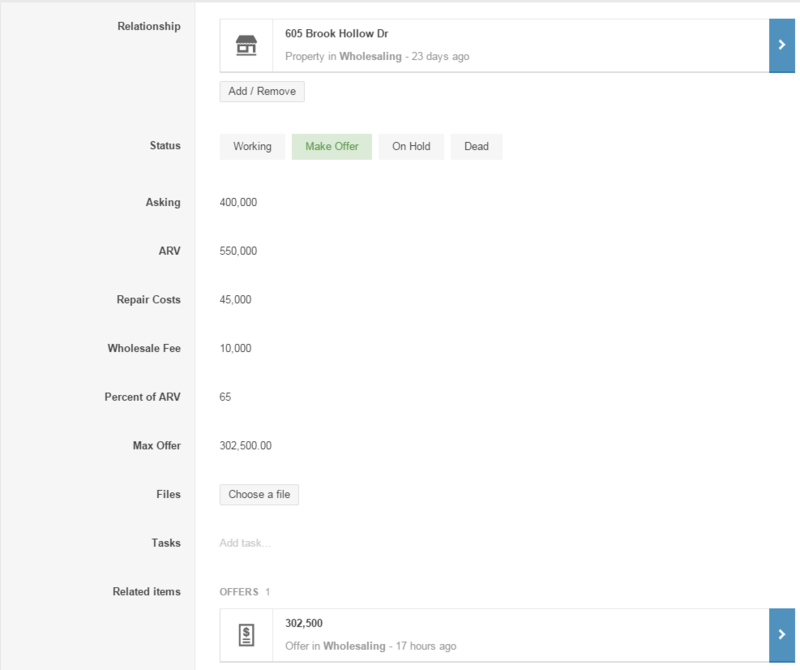 You can see that GlobiFlow is responsible for moving the flow from the Properties App through to the Offers App. Then Zapier is used to send the offer letter to Lob. Below I go into more detail about each step and how it works. There are 4 processes in total. Plus I go over an alternative way to send the offer letter to your leads by Email. Do me a favor...Share this post if you like it! GlobiFlow is in charge of moving the lead through the Podio funnel. My first GlobiFlow Workflow advances the lead to the Pursue App. 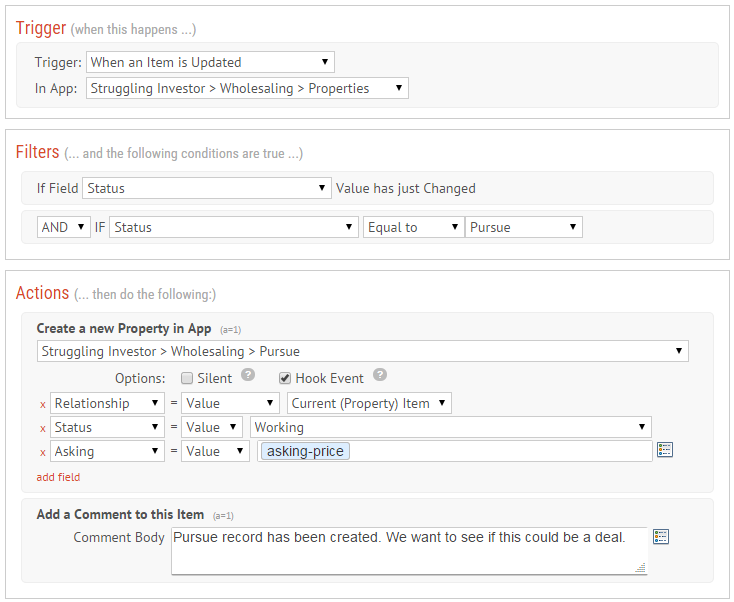 It does this by creating a new record (item) in the Pursue App that is linked to the Property App item. The action, in Podio, that triggers the GlobiFlow workflow to run is the changing of the Status value to Pursue. The GlobiFlow process for this is very simple. There are only three steps involved and none of them are complex at all. Again, GlobiFlow is in charge of advancing the lead through the Podio funnel. This time the process moves a lead into the Offer Stage by creating an Offer App record. This process is triggered when I change the Pursue record’s status to Make Offer. When a Pursue App item is updated I check to see if the Status value has changed to Make Offer. If it has, then I grab the Property record that the Pursue record references to help me create the new Offer App record. GlobiFlow allows me to do a pretty cool thing here. It will allow me to auto-create a mail merged document and attach it to the offer record with one click of a button (or creation of a record). This literally just happens! The only draw back is that you have to recreate your offer letter in GlobiFlow which may have some formatting limitations. My example Offer Letter is pretty basic so I didn’t really have any issues…but I’m sure there are some. When an offer record is created I get the Pursue & Property references so I can use the information in the offer letter. 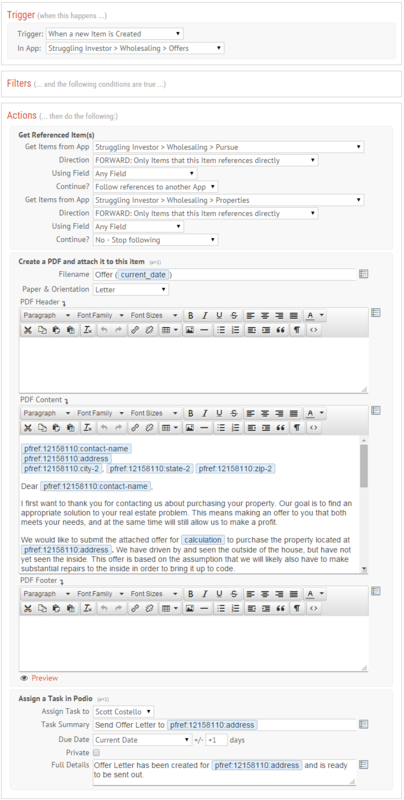 I then create a PDF file by merging my Offer Letter Template to the Pursue & Property information. I finally create a task to tell me to send the offer letter. This step is a bit more complicated because it requires Zapier to connect Podio and Lob. Even still it was pretty straight forward because Zapier does a good job of walking you through the process of setting the connection up. When I change the Send Offer By value to Mail (lob), Zapier will grab the Offer Letter (attached PDF) and Recipient information (Name, Address, City, State and Zip) and send it over to Lob to be mailed out. Since I haven’t actually sent any letters yet, I’m not quite sure how long it takes the letters to be printed and sent. My best guess is within 24 hours. I will be testing this out by sending a letter to myself and I’ll update this post with the results. It doesn’t cost you anything to create your Lob account. They charge you about ~$0.97 to send a letter though. The great thing that I have found is they have a Test Mode so you can test out your Zapier process without actually sending any mail….or being charged. An alternate to sending your offer by Mail using Lob is to just email the offer to the seller. I like this solution for it’s simplicity but getting an offer in the mail seems a bit more official to me. 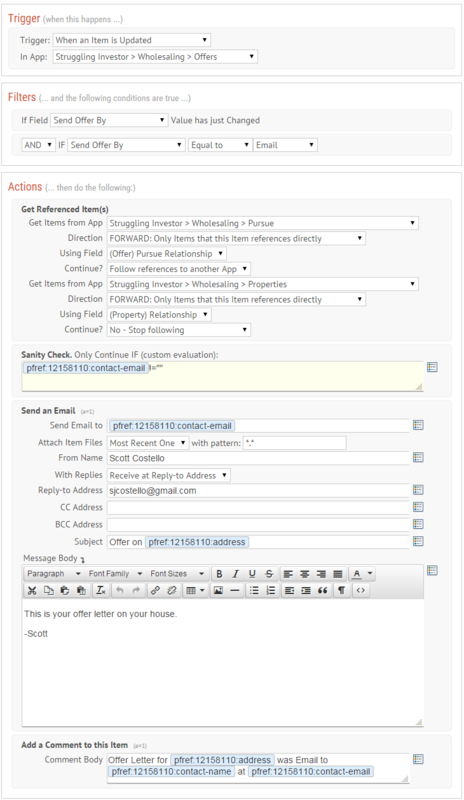 When the Send Offer By value for an offer record is changed to Email, GlobiFlow will grab the Offer Letter and send it to the Lead’s email address if one exists. I will walk you through the entire setup process over 8 custom made videos. It really is very simple and if you can duplicate this process you can pretty much do anything in Podio. Outside of the usefulness of this process in my wholesaling business, it has really helped me get a full understanding of Podio. I now feel extremely confident I can setup any type of process with little problem. The issue with Podio as a crm that I see is…there is a high dependency on third party tools (like Zapier, Globiflow and Lob) to really automate your small business needs. Don’t get me wrong though, this is also an AWESOME THING! Podio is an open platform which allows third parties to build tools to extend the use of Podio. Where would smart phones be with out app developers? That is such a great thing I can’t tell you. The only down side is that you have to keep track and learn multiple tools. The best way to do that is to document your processes kinda like how I’m doing with these blog posts. Hello,I’m getting a problem, when in Podio I have mora than one PDF,I would like to know how to send all or the last the user added. Good question. I’ll run some experiments and let you know how it goes. My feeling is that if I have multiple attached PDFs to an item that it will send them all. Perhaps there is a way to filter that though. How can I filter and obtain the last file(it’s a PDF that was generated)? I actually had to submit a support ticket on this one. Unfortunately the Zapier integration with Lob won’t work if you have multiple files attached. Apparently when Zapier sees that there are multiple files attached to an Item, it zips them up into one file. Lob doesn’t like this because it’s expecting a PDF, JPG or PNG file. So the process fails. There doesn’t look to be a work around to this using Zapier and Lob. When you have news, let me know , please. I want to resolve it. Bad news Victoria. Zapier said that there is no work around for this issue except to make sure that your Podio Item only has 1 attached file. There is no way to turn off the Zapier feature of zipping up multiple files. I suggested to them that they have a way to turn that off. I took a look at Globiflow to see if they have a way to connect with Lob and send only one file and there might be a way. I’ll have to investigate more. that’s too bad. What do you recomend me? you said that it’s possible to make a filter, how can I do that? When I was talking about a filter I had Globiflow confused with Zapier. Zapier doesn’t have that capability to filter out files attached to an app Item. I did read about one solution where you can use Globiflow to send an email (with an attached PDF) to Click2Mail to send out the letters. I haven’t looked into it but it seems like a decent solution. Hello Scott, I need your help please. I don’t know how to calculate some fields of the letter intent. Terms of Remaining Balance: Seller to carry back balance at 5% interest. Interest only monthly payments of $13500, with the full balance due of $300,000 in 5 years. Terms of Remaining Balance: 200 monthly payments of $2200 until paid off. I’m not sure what you are asking. Are you having a problem figuring out how to calculate a value in Podio using a calculation field? So you are looking for the actual formula, to put into podio, where you could calculate an interest only payment plan for a loan of $300,000 @ 5% for 5 years? You obviously can easily find a loan calculator to do this like here…. I want to know how to calculate that? What kind of results have you seen from emailing and snail mailing your offer letters/purchase offers to sellers? I am just curious if it’s worth the money and time to send these out as more of a marketing/follow-up strategy with sellers? How often have you emailed or mailed one of these out to a “dead lead” and later they called you back due to your mail out or email and you did a deal with them? Thank you for your time Scott. Your questions are good ones, but I’m not in a position yet to answer them. Right now my business model doesn’t have me making offers, my partners are making all the offers so we aren’t actively using the Lob integration for sending offer letters. How I would use it is almost like you said though…Use it as a marketing tool on leads you think are motivated but are having a tough time getting over the hump. If you have the offer letter “one-click-away”, it’ll be simple to just fire it off. Perhaps tell the seller that you’ll have an offer sent to them to show you are serious. Sending it will show them your are serious and also doing it so quickly will confirm to them that you follow through and can be trusted to some extent. make sense? That makes total sense Scott, and actually, that’s my reasoning exactly for deciding to integrate this method. Also, it’s a marketing strategy, but also a way to re-open negotiations between both the buyer and seller. My goal would be to have my assistant email “semi-motivated” sellers & mail “hot leads” that we were not able to convert into deals. I think this would keep costs down, and only mail to those who we were somewhat close to ever doing a deal with. As marketers, we need to maximize every dollar spent. This strategy allows us to “re-market” to the seller with something new and of true value. Thanks for responding! Seems like everyone I am talking to about Podio references you/your buyer lookup methods. Right now, my model is running pretty close to yours as I find leads and partner with a local that sells it. I appreciate the kind words. I wish I had more time to implement more things and share them. It’s awesome to think that people are using and referring my ideas. As always awesome content and detail to back it up. Really appreciate you taking the time to layout the setup in such detail. I hope to get this set up this week. 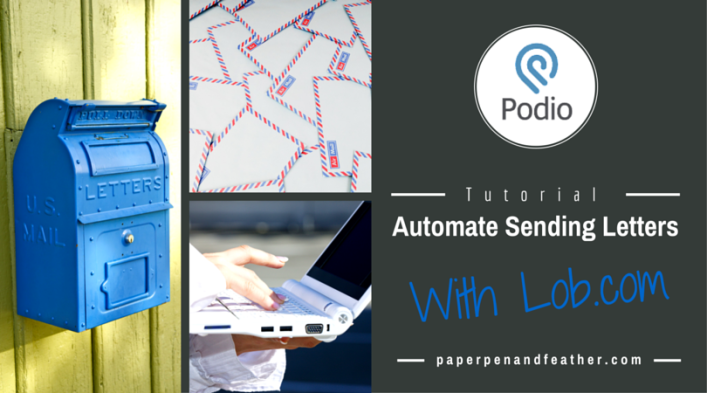 Even though I don’t use Podio, I’ve been looking for a solutions to automatically send physical mail from my custom CRM. Reading this I think I will give Lob a try. Also, I will tell my developers to implement some of the podio functionality into my custom software. Thanks. Hey Scott! Thanks for the post! I have been looking at Podio for a while! Ready to jump in now!! Great Andrew! Hopefully some of my tutorials can help you better understand how to use podio and get things setup.